A revolutionary smartphone technology to Play & Enjoy entertainment by just Sharing View of Videos, Music & Photos on multiple screens, even without network or any file exchange. Ever imagined, the plethora of audio video files on your phone today! The quirky video of your best friend’s crazy hip-hop moves or the last night’s retro jam session with your childhood buddies received on WhatsApp or even the pictures you clicked during your recent solo trip to the Himalayas! Unleashing the smart phone’s entertainment potential , VuLiv Player, India’s leading offline OTT entertainment platform announces VuShareTm, world’s only mobile technology for simulcasting a user’s Videos, Music, Photos on any multiple screens including Smartphones, Computers or even Smart TV without any additional hardware or even without internet or any additional cost. 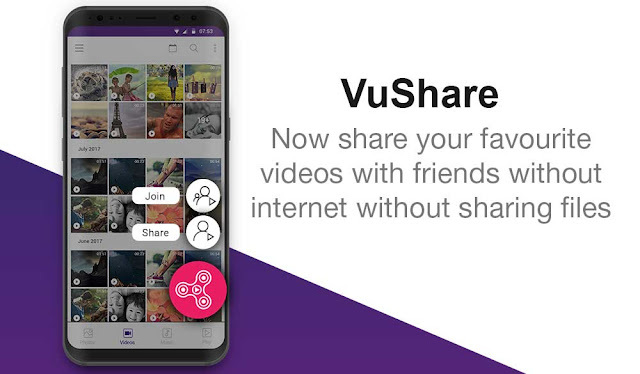 In order to enable VuShareTm Feature, users just need to click on the VuShareTm icon and enable a VuShare session to watch a favourite video together with friends or where friends can go even solo to watch their choice of content with full playback and sound controls. Friends can create their playlists and enjoy their favourites on the choice of their screen size or the sound systems, as each one of the VuShare session members have individual playback controls. The app uses proprietary software technology to connect with multiple smart devices at same time & creates 1 host to manage playback controls or playlist combinations. The technology is native to smartphone hardware and is built on core communication protocols which allows the host to beam dedicated speed for each connected device with no loss of content quality or buffering unlike faced even in a 4G network. A VuLiv host can enable a multimedia VuShare Session for non VuLiv customers also, who can access full playback and playlist controls via their mobile browser. Speaking on launch of the feature, Mr. Manoj Kumar Gupta, Founder & CEO, VuLiv, said, “A Smartphone User has inherent need of consuming UGC entertainment with friends & family but has lived with constraint of limited memory, Slow Network Speeds and time consumed in file transfer. With VuLiv Player, we solve all such problems of Organisation, Playback and now even Virtual Sharing of user’s media with no constraints of phone memory or network speed and yes, it comes free of any cost. Ø Even No Internet Required. The users can now create their own Mobile MULTIPLEX, whether in the middle of sea or on a mountain. Interestingly, there are more than 500 million offline users in the country, having Zero access to internet and only plays media on device. Around 300 million has intermittent availability while around 100 MN has 100% access to internet all the time. VuLiv Player aims to bridge this online – offline internet divide with offline technologies that helps organise, discover & broadcast at the same time. VuLiv Player, is native media OTT Entertainment platform, that bridges offline-online entertainment playback experience on smartphone, by converging users all Videos, Music, Photos & 400 hours of popular online entertainment into just 1 screen,1 smartphone application, thereby Simplifying Entertainment for the emerging market internet consumer. Till Date - VuLiv has served over 10 MN Users from OEM distribution, ~2 MN iOS /Google play downloads, Generating 1 billion playback platform minutes so far. Monthly basis - Generates 10 MN video views, 9 MN Listens, 40 MN Minutes, 2 MN MAU,200KDAU, where over 60% daily users are with AON 60 days & beyond.